ALUK will be using the FIT Show to launch what it says is the first UK aluminium system supplied with pre-inserted gaskets, a move the company says could halve the time needed to manufacture a window. Managing director Russell Yates explained: “The AluK C70S will be pitched directly at the mid-rise commercial market where there is still plenty of potential for growth in aluminium. 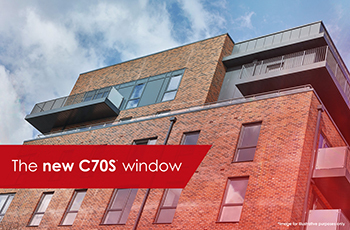 Thermal performance of the C70S is between 1.0W/m2K and 1.3W/m2K, a 50mm glazing option allows for improved acoustics and a max sash weight of 150kg for tilt before turn windows. It is also PAS24 accredited for inward and opening windows, making it suitable for all projects requiring Approved Document Q.
Russell Yates concluded: “We can’t wait to showcase this new window to customers at the exhibition ready for its official launch later this summer. It will be the platform on which we build an entire new range of products, giving our customers the same benefits of system integration which they already enjoy with the 58BW.